In celebration of Women’s History Month, Cooper Hewitt is dedicating select Object of the Day entries to works that celebrate women in our collection. We believe that this Italian Amorino Plate (also known as a coppa) dates from ca. 1600. 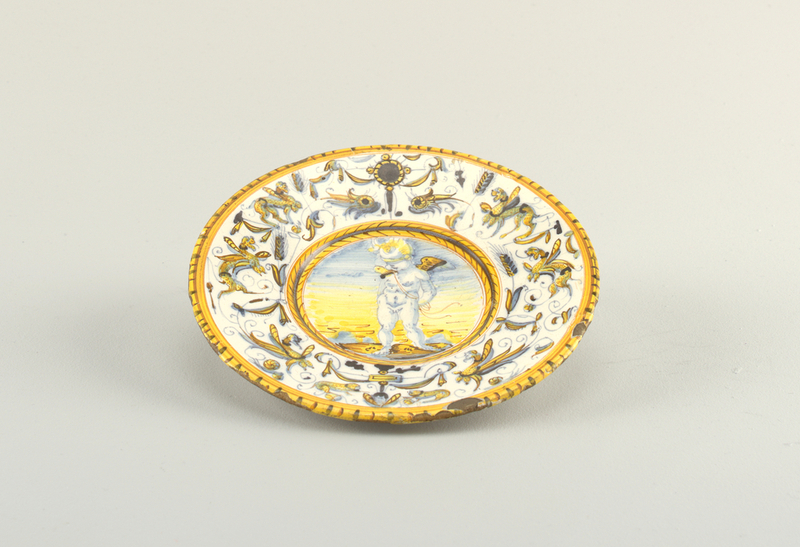 The cupid (or putto) painted in the center of the plate, which is a shallow bowl, represents love and fertility. Similarly, the motifs hand-painted around the wide rim of the plate, which include wheat sheaves, signify bounty and fertility. This iconography suggests that the plate was likely acquired on the occasion of a birth. Throughout the Italian Renaissance the importance of family and children greatly influenced material culture which often marked milestone events. Given the risks associated with childbirth, every effort was made to encourage and support mothers-to-be and new mothers. This comfort could take several forms, including the choice of positive imagery to incite pregnant women to visualize the blessings of healthy, happy children (preferably boys), as well as the supply of special foods to fortify the new mother. Dishes made of glazed earthenware (called majolica) such as this Amorino plate were often part of a childbirth set composed of several pieces – for example a plate, bowl, cover, and a small cup – called scodella da impigliata, which would be used to present the new mother with broth, poultry, and sweetmeats while she recovered and received visitors. The birth of a child was a rare occasion during the Renaissance during which a woman would almost literally be placed on a pedestal – sitting in a bed high off the ground, and kept warm by luxurious textiles acquired for the occasion. Catherine Powell is an MA candidate in the History of Design and Curatorial Studies program offered jointly by Parsons School of Design and Cooper Hewitt, Smithsonian Design Museum. Catherine is a fellow in the Product Design and Decorative Arts curatorial department of Cooper Hewitt, and an intern in the Museum’s research library. She is the editor in chief of “Objective: Journal of History of Design and Curatorial Studies”.